English author, mathematician, logician, Anglican clergyman, and photographer. "The pages with no illustrations aren't there." vowed he'd steal no more." "This teaching guide provides a useful introduction to word games adding another dimension to the written word. Follow Carroll's example, get creative with the English language, and explore it through anagrams and other word games." 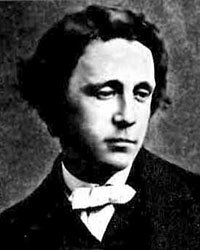 with the entire text of Lewis Carroll’s Alice’s Adventures in Wonderland and its sequel, Through the Looking Glass. This mind map is on page 36. "Turning the Pages™ uses the Shockwave plug-in ... to simulate the action of turning the pages of a real book." You can magnify the details. "Tim Burton tampers with the children's classic to his cost in this lifeless reimagining of Lewis Carroll's book." Alice in Wonderland (2010 film) - "a 2010 fantasy adventure film directed by Tim Burton"
The Matrix - Tumbling down the rabbit hole. . . The script is below the video on YouTube. « This is your last chance. After this, there is no turning back. You take the blue pill – the story ends, you wake up in your bed and believe whatever you want to believe. "The Cheshire Cat comes from Alice in Wonderland. Sally comes from Cheshire and loves this character." I lose the time I save..."
the Red Queen, and the Dormouse. " "An adaptation of Lewis Carroll's classic children's poem as told through the eyes of Thom, the child in the poem."